One of the questions our friends and family sometimes jokingly ask is how we manage to get on for up to four weeks at a time when living in our motorhome – the interior of which is a little smaller than our bathroom at home and doesn’t allow you to stand upright. So how do we manage? Inspired by Richard’s recent post, “Getting Away”, I thought I would note down a few of the things we’ve learned over the last few years. Like Richard, we are fully prepared before we leave the house. The fresh water is full, the waste water and toilet are empty and the bed is made up and only needs to be pulled down into position. Similarly, all our food and drink is stored away properly so that it is not in the way but is ready to use when needed. Starting off with everything in order makes things easier – the flip side of this is that everything has to stay this way, especially in a small van. We live by the words, “A place for everything, and everything in its place” – it may sound a bit OCD, but it enables us to manage much more easily than you might think, self catering and without using campsites. The area under the seat/bed provides a surprising amount of storage - under the seat cover, we leave the fitted sheet over the mattress, saving time. Although it is only a 5m van, our conversion was intended from the start to provide plenty of storage, as we knew we were planning some long (2-5 week) European trips. Our bed, although it is hard to raise up and down, provides an uncommonly large amount of storage underneath. This is where we store our walking boots and the majority of our food, drink, loo roll, etc. Behind the nearside rear wheel arch we also keep two 10 litre water containers that we use to supplement the 25 litre container into which the tap is plumbed. The full height cupboard at the back of the van is quite deep and is divided into two with a removable shelf. Below the shelf (also accessible from the rear without removing the shelf) is the leisure battery and plastic crates with tools, toilet fluid bottles, mains hookup lead, etc. Above this, on top of the shelf, is our wardrobe. We don’t waste space with hanging clothes – we have six small, stackable plastic storage crates with lids (from a pound shop) into which all of our clothes are carefully packed. We then rotate the crates around and gradually work through our clothes, packing dirty clothes into an empty crate. Clothes pack a lot smaller if you roll them up tightly (underwear or t-shirts) or fold them small (trousers and sweaters). This ‘wardrobe’ arrangement works extremely well and makes good use of the space, into which we also fit our toilet bags, camera, laptop bag and wireless antenna. It also makes loading the van simple – we can pack the crates in our bedroom and then carry them out to the van and put them straight in the cupboard. Under the sink we have 25 litre fresh water and waste water containers, plus some homemade shelving where we store food and utensils that is ‘in use’ – bread, cooking oil, saucepans, etc. Similarly, in the fridge, we have fresh food and opened food like half-used tins. We do not usually use campsites and so most of the time we rely completely on the facilities we have onboard – a toilet, sink and cold tap. You can manage surprisingly well with cold water, a sink and a flannel, or if you are more delicate, water warmed in a kettle and a sink. As for privacy, that is very much down to personal preferences. It is a lot easier (especially in bad weather) if you are not too bothered about this. If you want bathroom facilities, get a different van or stay on a campsite! Getting On With Each Other! I’m afraid this is down to you and your other half. All I will say is that a small van is a bad place to have a big row. Much better to acknowledge each other’s foibles and adapt to them while away or discuss them before you go away. We have found that we have gradually developed exact routines for almost everything – getting up, going to bed, toilet use, washing up, having a pre-dinner drink – and that this makes it a lot easier to live comfortably in such a confined space. Both being tidy also helps. For more motorhome travel tips, check out my wild camping guide, our guide to European motorhome service areas and our suggestion for keeping your motorhome clean while on the road. Plus we have just reviewed the long range wireless antenna we use for internet access while we’re away from home. Great post, thanks for the link – glad to have been an inspiration. A place for everything, and everything in its place is one of our mantras too – thinking small is the only way to get along in a small camper! Great post and yes, “a place for everything, and everything in its place”. 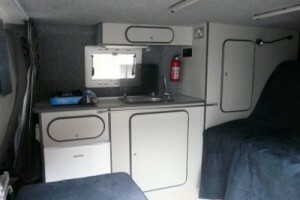 It enables us to manage more easily especially in a small van. Thanks for sharing your helpful tips and advice! I must agree with everything that’s already been said. We did 4,500 miles round Europe in May & July and, believe or or not, our first night our the trip (at Dover) was the first time we’d slept in the van, which we’d bought 3 months earlier (a VW T4 Westfalia). We soon discovered that, like the writer, the better organised you are, the easier life becomes, and developed a routine for things like opening the bed our each night – each of us having their own ‘job’ and not getting in the way of the other when they’re doing ‘their’ part of the routine. This also applies when arriving at a new site and setting everything up – especially the awning. It does help if one of you knows what the other should be doing – and the other one is actually doing it! Above all, don’t have a row!!! Being the ‘cabaret act’ for other campers to watch doesn’t help anyone to make new friends on a new site. I was diagnosed with bladder cancer 3 months ago, I’ve had a operation to remove the tumour, and bcg treatment, this treatment will be ongoing every 6 weeks, that’s 6 weeks of treatment, then 6 weeks break, until at least march 2017, then who knows. Anyway, things with my partner really not going well and we decided to separate! So I got myself a 2002 Berlingo multispace, removed the rear seats, and fitted a bed, cooker and sink, nearly finished, just a few final things to do, and the cad1 explorer is ready to go!!!! In my 6 week break between chemo, il be off. I’ve covered the van via rac recovery so if she does break down, at least il get home, where ever that may be, probably my mom’s lol. Anyway, sorry to bore you but any advice, as regards where to stay, as I don’t want to use campsites. Il be traveling around Wales, first outing. Regards Sam caddick aka p password. Sorry to hear about your illness and domestic troubles. Hope the treatment goes well for you, I know from family experience it can be quite gruelling. As regards camping in Wales, if you’re planning to avoid campsites you’ll need to find what works for you. Obviously this is the UK, so there aren’t really any proper aires. Overnight parking is possible in laybys and unrestricted car parks, although the availability of these varies widely. If you want to get off the road properly, one option might be to consider spending some nights at Brit Stops, which now has about 50 locations in Wales. They’re often pub car parks and can be quite rural and peaceful. Brit Stops do require you to be self contained, however, so strictly speaking you’d need an onboard toilet. With non-campsite touring, I think it’s a case of finding what works for you. People do it in all sorts of ways, there’s no one size fits all. Personally, I’d try and budget for a few campsites if possible as a fall back. You don’t have to use them but they can be very useful and more comfortable than wild camping. Hope this is some help, sorry for the slow reply.